Juni Dahr in Hedda Gabler by Visjoner Teater. Photo: Anders Lien. If you are in Norway, at any time of the year, you may see outstanding examples of Ibsen, Norway’s most important artist. But if the time is September that means the international Ibsen Festival, Norway’s biggest festival, which brings together audiences, artists, scholars and critics from many different culture and nations. Organized by the National Theatre in Oslo, this year’s 16th International Ibsen Festival (8-19 September) presented fifteen different productions including two Hedda Gablers from Norway; three Peer Gynts (Norway, Sweden, France); one Lady From The Sea (Norway), An Enemy of People (Chile); The Vikings of Helgeland (Norway), Little Eyolf (Norway); and other adaptations and mixed performances using rap music and street poems influenced by Ibsen. After the opening ceremony during which the festival director Hanne Tømta gave a public address in front of the National Theatre and crowned the Ibsen statue there, the festival began with a premiere of The Master Builder on September 8 staged by National Theatre and directed by Stephane Braunschweig. 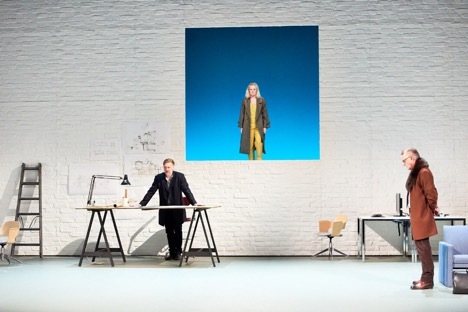 After his stagings of Brand, Peer Gynt, Wild Duck, French director Braunschweig this time once again presented a dazzling interpretation of Ibsen’s play. Master Builder directed by Stephane Braunschweig. Left to right: Solness (Mads Ousdal), Hilde (Mariann Hole), Dr. Herdal (Lasse Lindtner). Photo: Øyvind Eide. At the beginning of the performance Solness appears as a professional, cold, unsympathetic, hypocrital. He is the unfaithful husband of Aline (he makes love with Kaja in the office even though Aline is aware of everything), a relentless master of the young architect Ragnar (Mikkel Bratt Silset); a selfish lover who is manipulating the bookkeeper Kaja Fosli (Rebekka Jynge). He is, moreover, troubled by an inner world which is haunted by fear of falling and the hidden sin behind his success. Braunschweig’s staging is based on the Solness’s ambivalent world, his megalomania which is presented as a mid-life crisis blended with a haunted guilt about the past. The “crack in the chimney” which was the cause of the fire in the past and which gave him the opportunity to become “Master Builder” after the fire, is suggested now again in front of him as a rupture or a gap in the stage design. It is the piece of sky—suggesting hope, desire and youth—early in the performance when Hilde jumps from it into the stage and pushes Solness to climb up again. This gap opens between desire and fear, guilt and success, hope and disappointment, future and past. Towards the end of the performance, when Solness decides to climb up his tower in order to give Hilde what she desires and wishes, the scene changed and presented a contrasting view. Now there was a huge absorbing whiteness like a tube with a black hole. The question is what we will do if we are at the crossroads between the desire and fear, hope and frustration? What does it mean for Solness to climb as high as he built and fall down from the top? Did he accomplish his own goal by climbing to the top or did he meet defeat in falling? Hilde celebrates his success over his lifeless body (“My, -my master Builder”), while others announce his failure (“This is so terrible, he couldn’t do it,”“Mr. Solness is dead”). The answer to “what really happened to Solness” is left up to the audience; there was no specific, objective answer to the question of whether he is the Master reflected in the eyes of Hilde or the miserable man whose body was dashed to pieces after youth came banging at the door. Mikkel Bratt Silset as Ragnar in Master Builder. Photo: Øyvind Eide. I must say that I was fascinated by the scenography since it carried portrayed so clearly the ambivalences of Solness’ strange story. 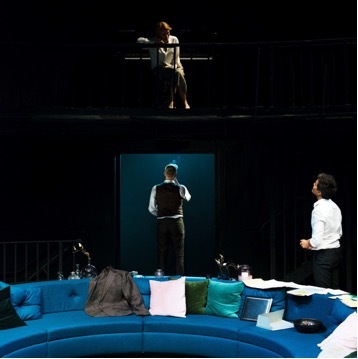 On September 11, I attended a new Hedda Gabler production from the National Theatre staged at Torshov by Sofia Jupiter, a director much praised for her staging of Jon Fosse’s Sleep in 2006. Taking advantages of the venue Torshov’s physical opportunities, the play area was transformed into a triplex villa (Falk Villa) by set designer Erlend Birkeland, where Hedda (Kjersti Both) and Tesman (Hermann Sabado) were having their first night after their six-month honeymoon. What we see on the stage is a large, well-appointed, modern living room including a blue corner couch, two doors opening to other rooms, two stairways, and upstairs where Hedda plays her piano (only at the end of the performance). In addition, the lighting design (by Philip Isaksen) suggests a gloomy, dark, uncanny atmosphere in accordance to Hedda’s inner world. Sofia Jupiter’s Hedda Gabler. Photo: Øyvind Eide. The performance began with Tesman’s conversation with Aunt Julie (Marika Enstad) and there was no reference to the maid Bertha who, I guess, was presumed to be downstairs to open the door for unexpected visitors, since everyone enters the stage freely by climbing up the stairs. What surprised me during the performance was to find Hedda Gabler in very close relationship–touching, holding, behaving a little freshly—with Aunt Julie and others. This Hedda did not seem to be the powerful, attractive but somewhat aloof woman I have seen in so many performances of the play. It was somewhat difficult therefore to understand and feel how and why she has such power on others. I do not feel this was because of a lack of acting skill, but seemed to be a conscious choice on the part of the actress or director—perhaps seeking to make the character more sympathetic. The performance was beautifully choreographed, especially in developing such triangular relationships as that between Brack, Hedda, and Tesman or between Thea, Hedda and Tesman. 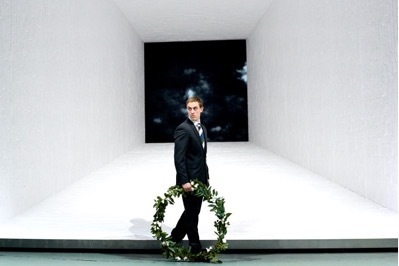 Another thing I found particularly interesting in this performance was Hedda’s suicide. She shot herself not in the temple but in the bowel, in the same way as Lovborg did, and it was the first time I had seen the final scene of Hedda Gabler done in this way. What was the reason behind this choice? Two main possibilities occurred to me: First, there were so many references to Hedda’s pregnancy that this final scene showed that as the cause of her choice. Second, she had given up her vision of finding “beauty in something” and so killed herself like Lovborg. The other Hedda Gabler was a much-awarded performance, staged by the Visjoner Teater. This was founded by a leading Norwegian actress. Juni Dahr, who played the role of Hedda Gabler in this site-specific performance. It took place in a house in a forest, a part of Bygdøy Royal Estate. The environment and landscape seen from the large windows of this house added a rich dimension to Hedda Gabler. It was possible to witness who, like Thea, Brack or Lovborg, was coming from outside, from garden to the house. The audience was seated in the living room and from this point we witnessed not only the things happening inside the room but nature, with the light of day slowly fading, the city in the distance, the sky, trees, that is to say, how nature seemed to reflect Hedda’s and other’s intentions and desires. We were shown offstage actions not in the distant past but the present time of the performance. 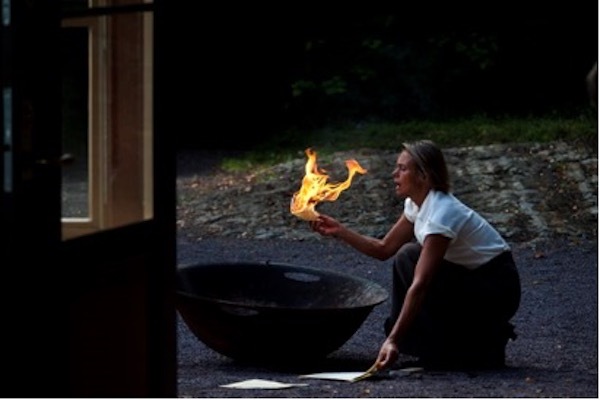 Some actions took place in the garden such as Hedda’s burning the manuscript, her shot and her final suicide. One of the memorable stagings at the Ibsen Festival was the Peer Gynt from Sweden produced by the Dramaten from Stockholm and directed by German director Michael Thalheimer, who is renowned for his productions of classics like Faust, Wild Duck, Antigone and Medea. 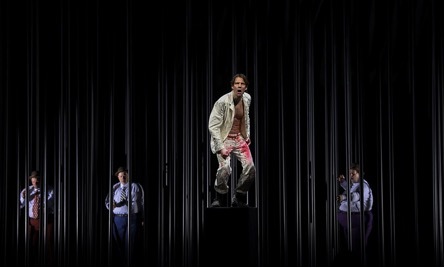 Peer Gynt from Sweden, staged by Dramaten from Stockholm, directed by Michael Thalheimer. Photo: Dramaten, Sweden. 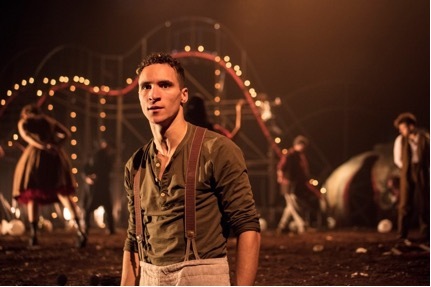 The set consisted of round bars which gave a sense of a forest or a world where Peer is struggling with things while he is travelling around the world to find himself. In addition, there was a square pillar in front of the stage where Peer spent most of the performance standing, sitting on it in pain, fear, passion, anger, frustration, in a variety of emotions. In this shortened adaptation, Peer (performed by Erik Ehn) seemed to me a living sculpture, a familiar visual figure, or an icon which we may trace from Greek art to the eighteenth century. This was a story of a man at the shore of death and life, sorrow and joy. I must say among the wide range of affecting performances I attended at the festival, it was the Thalheimer Peer Gynt which struck me with the most intense feelings. Moreover, I must also say that it was heart-wrenching to witness Peer Gynt’s sorrow in blood. Erik Ehn’s acting was memorable and deeply affecting. It was the most impressive Peer Gynt I have seen recently. The main set was an amusement park where gypsies were living in a carnival atmosphere. At the backstage there lay a huge clown mask which represented Peer’s duality: selfhood or masks of joy or pain. Each scene began with Peer’s high energy, his joy, his courage but then ended with his defeat, lying in front of the stage in pain recalling that ruined huge mask lying at the back of the stage. It is a kind of life-cycle which was repeated in each scene. Clemence Ardoin as Peer Gynt, directed by David Bobée. Photo: Dramaten, Sweden. One of the most often staged plays of Ibsen around the world is, beyond doubt, An Enemy of the People. 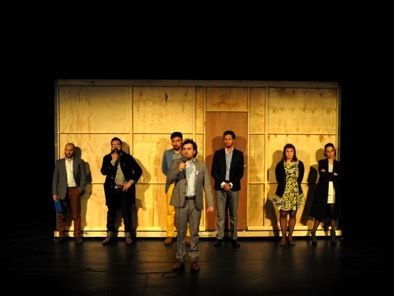 The Ibsen Festival presented one production of Enemy of People from Chile staged by the Chilean theatre company Collectivo Zoologico, directed by Nicolas Espinoza and Laurene Lemaitre. Based on the same environmental problem, water pollution, as in Ibsen’s text, the Chilean Dr. Stockman was confronted with political problems since he revealed how the one of biggest economic sources in the country, fishing, was in danger because of poisonous waste. In this Chilean approach, the set was designed as a movable room located in the middle of the stage. 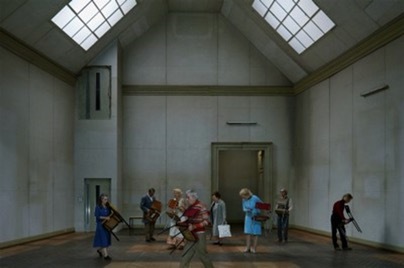 This room transformed into other places: the living room at the Stockmann’s house where the performance began with a party gathering together all characters; an office at the TV-Channel “Voice of People” instead of a newspaper office. With video and projection devices showing the action from different points by camera’s focusing on bodies to reveal the contradiction between words and actions throughout the performance, it played with idea of transparency, righteousness, false solidarity as well as gender inequality and socio-politic hypocrisy. What drew my attention in this performance was to see Dr. Stockman not as a righteous, virtuous man who tells the truth in all conditions. He was doing what he must do but on the other hand we were shown how he treated his wife with traditional gender bias (“I have responsibilities for society, but you have responsibilities for the home and family”). His wife was concerned primarily with cleaning the house and looking after the baby while the others were smoking, drinking and fighting for political-social issues even though this house seems a meeting point for intellectuals. Enemy of the People from Chile, presented by Collectivo Zoologico, directed by Nicolas Espinoza and Laurene Lemaitre. Photo: Collectivo Zoologico. The news release scene was organized as a forum theatre reminiscent of Ostermeier’s Enemy of the People. We in the audience were asked questions about the Dr.Stockmann’s situtation and invited to talk about it. But the audience mostly talked about the relation between the role of Ibsen’s text for today and Chilean performance. The other interesting thing I found in this performance happened at the end. His wife left her husband Thomas Stockmann and her baby, recalling Ibsen’s Nora. This Chilean Dr. Stockman was the man who lost everything –his job, family, friends- and he has no place to go. The 2018 Ibsen Prize winner Christopher Maller’s performance, Familiar Feelings, Mixed Faces. Photo: Christopher Maller. In addition, the Ibsen Festival announced the winner of the International Ibsen Prize. This year, the winner was Swedish director Christopher Maller. His company staged Familiar Feelings, Mixed Faces, a collage of many songs and few words, a kind of scenic exhibition which treated the stage as the storage area of a big art museum and the actors as an exhibition product. *I would like to thank to Monica Lindanger from National Theatre in Oslo for her kindly inviting me to the 2018 Ibsen Festival. Eylem Ejder is a PhD candidate in the Department of Theatre at Ankara University, Turkey. She is a member of the International Association of Theatre Critics—Turkey Section and assistant editor of the theatre journal Oyun (Play). She is currently writing her dissertation, entitled “Narratives of Experience: Monodrama in the Post-2000s Turkish Theatre.” Her PhD studies are being supported by The Scientific and Technological Research Council of Turkey (TUBITAK) within the National PhD Fellowship Programme.